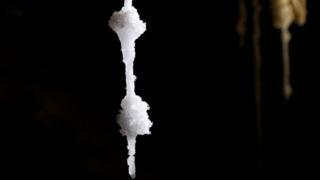 Israeli researchers say they have discovered the world's longest salt cave. The 10km (6.2 miles) of passages and chambers inside Malham Cave, overlooking the Dead Sea, were mapped out over two years. 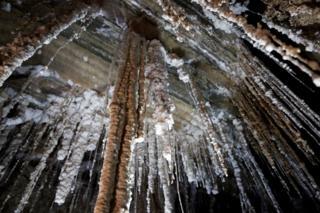 The desert site was near where, according to the Bible, Lot's wife was turned into a pillar of salt. Rain is expected to lengthen Malham further over time, the researchers said. This happens when rainwater flows down cracks in the surface, dissolving salt and creating semi-horizontal channels along the way that flow down towards the Dead Sea..
Part of the Malham cave, which runs through Mount Sodom, had already been mapped during the 1980s. 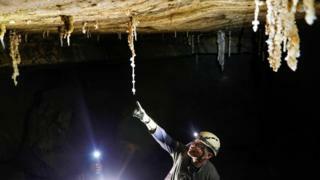 Two years ago Yoav Negev from the Israel Cave Explorers Club decided to complete the survey and set up a team of researchers and caving experts. During one dinner break in the cave, Boaz Langford from the Hebrew University in Jerusalem said the explorers felt their pasta lacked seasoning. "So we just broke some salt off one of the rocks and used that," he said. 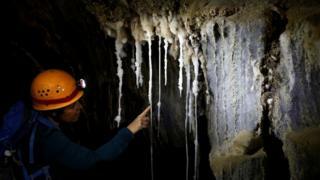 Malham has taken a 13-year record held since 2006 by the Cave of the Three Nudes, a 6.85km (four miles) salt cave in Iran's Qeshm Island, the researchers added.